My home state New Mexico’s in the spotlight once again; today marks the 63rd anniversary of a little event we call ‘The Manhattan Project.’ Now, is it just me or are these folks sitting just a little too close for comfort? Maybe the old saying “If I knew then what I know now…” comes into play? Forcefully marking the continued importance of the West in the development of nuclear weaponry, the government detonates the first of a series of nuclear bombs at its new Nevada test site. Although much of the West had long lagged behind the rest of the nation in technological and industrial development, the massive World War II project to build the first atomic bomb single-handedly pushed the region into the 20th century. Code named the Manhattan Project, this ambitious research and development program pumped millions of dollars of federal funds into new western research centers like the bomb building lab at Los Alamos, New Mexico and the fissionable material production center at Hanford, Washington. Ironically, the very conditions that had once impeded western technological development became benefits: lots of wide-open unpopulated federal land where dangerous experiments could be conducted in secret. 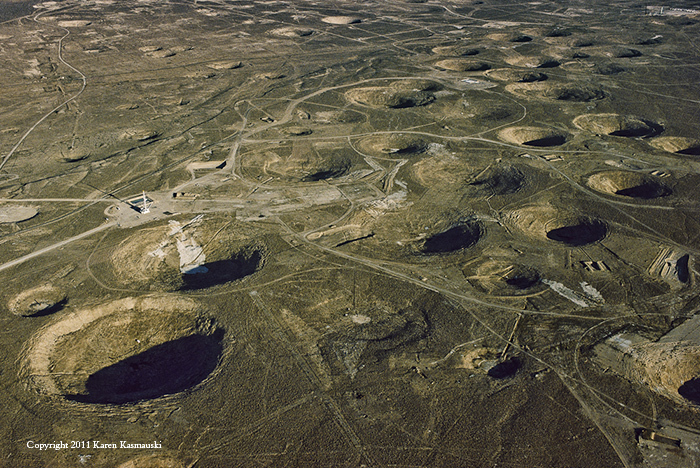 Craters from nuclear tests dot the landscape of Frenchman Flats at the Nevada Test Site. via First atomic detonation at the Nevada test site — History.com This Day in History — 1/27/1951.